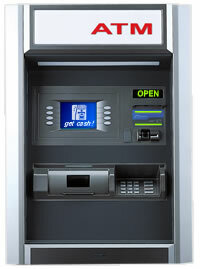 The look and feel of a bank machine in an economical Through-The-Wall solution. Higher transaction volumes through increased reliability and uptime from the use of proven, low maintenance components. Whether installed as a walk-up or drive-through, the Mini-Bank 2100T offers solid, weatherized construction while its compact architecture allows flexibility in mounting. 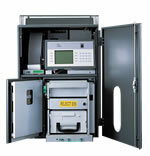 A UL 291 business hours vault with quality electronic lock is standard. Heavy duty metal fascia, pedestal and retaining brackets provide a stable, secure mounting. The dispenser is contained separately from the other serviceable components, allowing access for technicians without having to open the vault. The printer slides out for easy paper loading and maintenance. Optional service panel allows configuration, diagnostics and maintenance from the rear of the machine. Sun viewable monochrome transreflective LCD panel, lighted / voice guidance and covered cash tray provide convenience for customers.